Samoëns – A hidden gem? Having never visited Samoëns, we were always a little unsure as to why so many Brit skiers return year after year. However, this was rectified this last year and Samoëns is now one of our favourite resorts! The main feathers in its cap are the very short transfer (under an hour on a good run from Geneva) and a truly beautiful village centre. The town centre has a very good variety of bars, shops and restaurants and feels more like a small town than a ski resort and we think that’s where it’s beauty lies. It’s a welcome change from a Meribel or St. Anton. The main street through the centre of town is strewn with all sorts of shops, from the ironmongers all the way to the various ski hire outlets. There are two main hubs for apres-ski, the Glacier hotel has a lovely outdoor bar that shares a small square with several other bars such as the Aspen and The Place 2 Be. As you walk through town, you then reach the main square which is made up of a wide range of bars and restaurants. Whilst the nightlife on offer cannot be compared to Meribel, Val d’Isere or St. Anton, there is actually a good choice of nightspots and all but the rowdiest of groups will find them more than enough for a week. 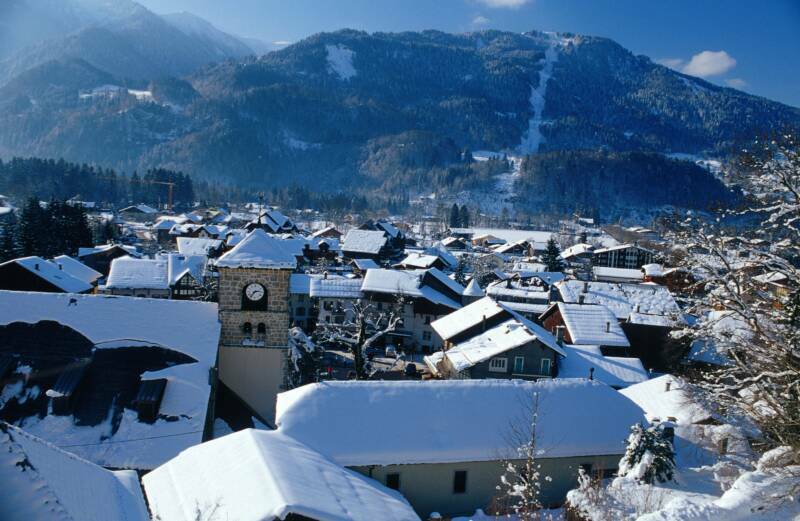 The skiing is superb, as part of the Grand Massif ski area, there is something here for everyone, whether it be the high alpine bowl skiing above Flaine or the glorious tree-lined skiing down towards Les Carroz and Samoëns itself. The ski access from Samoëns does need to be explained though, the main gondola isn’t in the town centre because the skiing came much later than the town did! So the Grand Massif gondola is on the outskirts of town, you can easily walk it from most of the available accommodations but all the chalets we sell in Samoëns offer a driver service to whisk you to the skiing. The main point to explain is you can’t ski back to the resort, you take the gondola BACK to Samoëns. We think this is a small price to pay to stay in such a glorious, charming and typically French village. We work with a small selection of chalet operators in Samoëns but we can fit most group sizes thanks to flexible accommodation. Our favourite chalets are the Grande Ourse (check out the pool table lighting!) and eponymously named Chalet Samoëns.